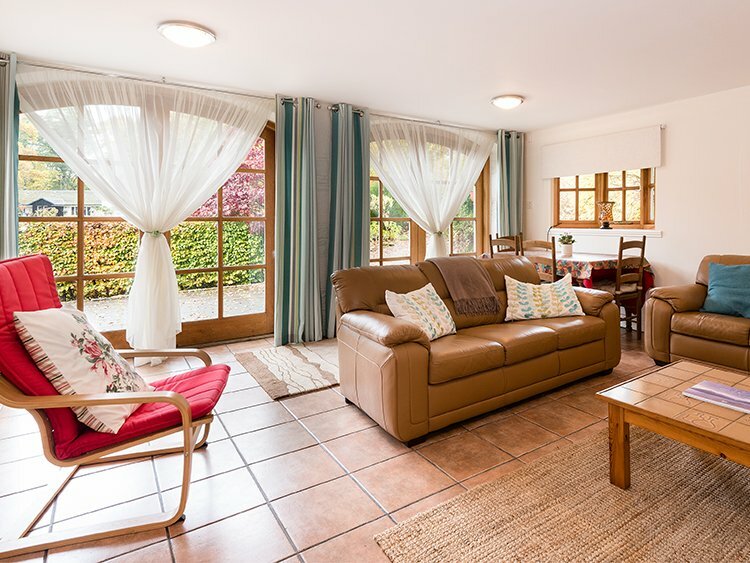 Gill and Colin would like to extend a warm welcome to the Old Armoury, their home in picturesque Pitlochry in the stunning Southern Highlands of Scotland. The Old Armoury enjoys an enviable location within a woodland setting, between Loch Faskally and Pitlochry’s Victorian railway station. The Old Armoury dates back to the early 1900s. It was the Drill Hall and Armoury for the 1st Scottish Horse and the 6th Battalion of the Black Watch, before they headed off to Europe to play their part in the First World War. At various times over the years, it has also been a prestigious restaurant and a potter’s workshop and tearoom, evidence of which can still be found around the property to this day. So come, make yourself at home and unwind in our cosy, self-contained Annexe, the ideal place for a relaxing break surrounded by some spectacular scenery. 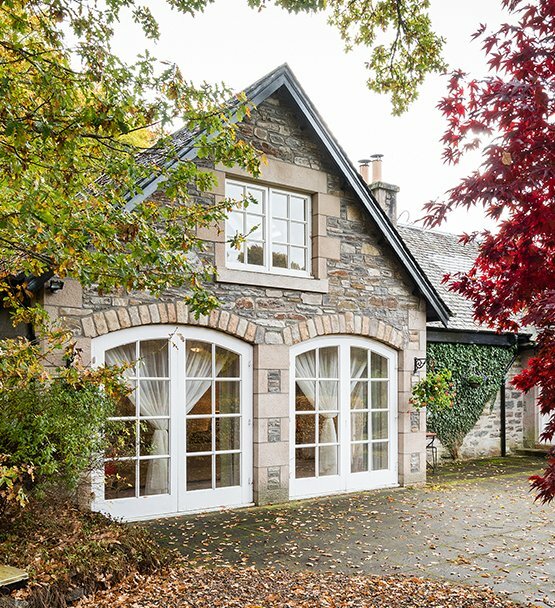 ‘A perfect location, quiet, peaceful but within walking distance of all that Pitlochry has to offer’. Well-equipped kitchen: including oven, hob, microwave, fridge, toaster and kettle. Large sitting / dining room with 2 large sofas, occasional chairs, dining table and 4 chairs, LCD TV, DVD player, DVDs, books, board games and puzzles. Light, spacious bedroom with very comfortable king-sized bed. Uninterrupted views towards Loch Faskally and the hills beyond. En-suite shower room with hand basin, WC and double shower. Patio area with table and chairs for al-fresco dining or simply relaxing and watching the sun go down. Dedicated off-street parking for one car. Bed linen and towels are all provided, together with essential toiletries. 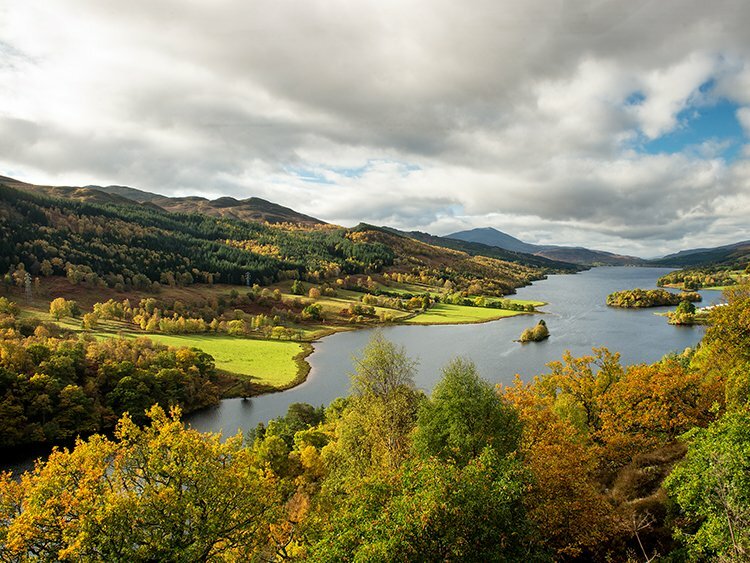 Pitlochry is a bustling traditional Scottish town, providing an excellent base for exploring Perthshire and the Highlands, or just as a stop-over on your Scottish odyssey. The area is also full of activities to suit every generation. This highly acclaimed venue is just a short walk across the Dam from The Old Armoury. Enjoy a Musical, play, concert or try your hand in one of the Arts workshops. This little woodland garden is a haven of peace and tranquillity. It celebrates Scottish plant hunters and the epic journeys they undertook to bring back plants from all over the world. No more than a short stroll from your doorstep, pay a visit to the Fish ladder to catch a glimpse of some of the 5000 salmon that migrate up stream every year. New Visitors Centre opened in 2017. 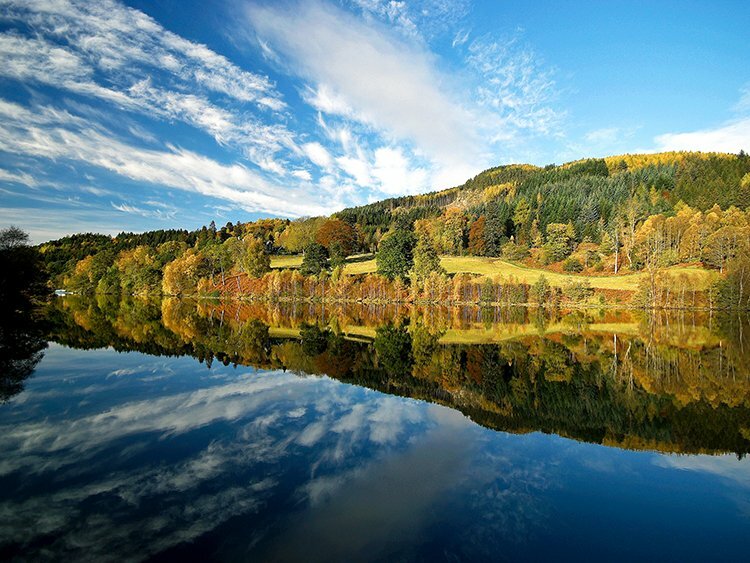 Just beyond the gate to The Old Armoury is Loch Faskally, which has views that change with each passing season. Don’t forget the Enchanted Forest, which takes place every October and never fails to impress. Visited by Queen Victoria in 1866, this viewpoint remains one of Scotland’s most magnificent vistas, looking away, as it does, towards Rannoch Moor and Glen Coe. Only 18 miles from town, voted the ‘ Best Visitor Experience’ in Scotland. A day at this venue encompasses exhilarating Land Rover safaris, a Red Deer Centre, walking, biking and even gold and gem panning! All of which can be topped off with a coffee and visit to the gift shop. 7 miles north of Pitlochry and surrounded by stunning scenery, the castle is home to Europe’s only private Army, the Atholl Highlanders. From Edradour, the smallest, to Bell’s Blair Atholl distillery, one of the oldest and, not forgetting Dewar’s alongside the River Tay, there are plenty of opportunities to savour the ‘uisge beatha’ or ‘water of life’! Last but not least, given the historical background associated with The Old Armoury, why not pay a visit to the home of the Black Watch? Explore the Castle and Museum, take in one of the regular exhibitions, visit the shop and end your trip with a delicious lunch or snack in the café. 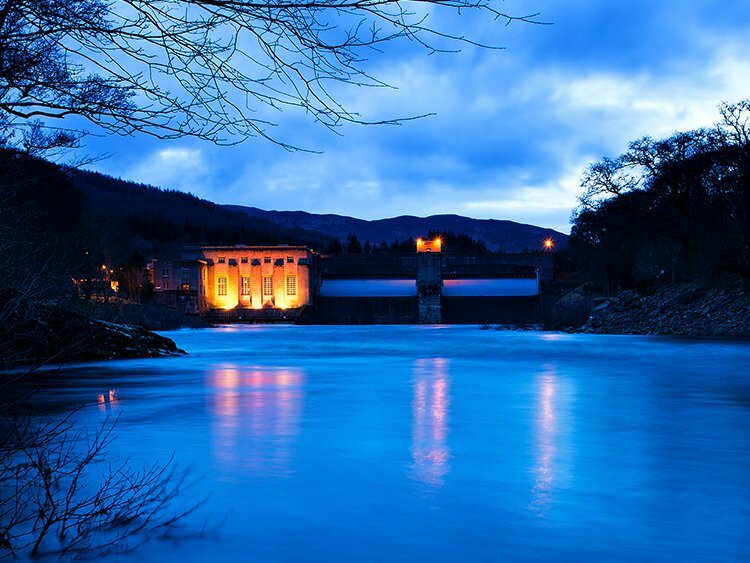 The Old Armoury Annexe is centrally situated in Pitlochry, only a few minutes walk from the town centre, train and bus stations and the famous fish ladder and dam. It is also only about a 10 minute walk to the Festival Theatre.